Mr. HIStalk was kind to offer me this opportunity to periodically share anecdotes, observations, and insights from my career at the intersection of healthcare and information technology. My goal in writing for HIStalk is two-fold: to support life-long healthcare folks charged with transitioning from a fee-for-service to a fee-for-value healthcare proposition, and to encourage young tech entrepreneurs who are building important solutions that accelerate healthcare transformation by giving them the best opportunity to succeed, given an array of unique challenges and historical realities. My first job out of business school, over 25 years ago, was as a sales rep at IBM, which just so happened to assign me to the healthcare vertical. I thought then, “Healthcare is really screwed up. Certainly technology should be able to fix this mess.” While over the past quarter-century we have made some progress moving around the deck chairs on the Titanic, for the first time ever, it is clear that long-awaited, meaningful disruption is beginning to happen. Subsequent to IBM, I have held sales, strategy, and leadership positions at early and growth stage companies including ESI, Eclipsys, HealthStream, AirStrip and Valence Health. Recently I joined Charlie Martin, a lifelong hospital operator and the founder and CEO of Vanguard Health Systems (now Tenet) to develop Martin Ventures. The Nashville-based firm invests in ideas and innovations that apply integrative approaches that simultaneously improve care, improve health, and reduce the cost of healthcare. Being a part of Martin Ventures has lifted the curtain for me on the venture capital and provider mindsets, which entrepreneurs must appreciate to build a successful business. Having delivered thousands of presentations over the years, I am now on the other side of the table. I sit in the audience with my "investor hat" alongside long-time healthcare executives. The first observation I feel compelled to share is about your pitch deck (this also applies to sales presentations from vendors to prospects). To you, your message is unique and compelling. To your audience, this is the 20th presentation they have sat through this week with people who look just like you and are saying the same thing. Add to that, they have had a history of being misled by exaggerated claims, so skepticism is in the air even if they manage to stay awake while you read your slides. At a recent conference with rapid-fire presentations from aspiring and emerging digital health entrepreneurs, Charlie (who has been building bricks-and-mortar hospital systems for 50 years) leaned to me and commented, “I don’t understand why anyone in the US still has diabetes. All these people have already solved the problem.” That is my point — you all sound the same! My favorite TED Talk is a popular one from Simon Sinek, who reminds us that, “People don’t buy WHAT you do, they buy WHY you do it.” Reflecting on and embracing this idea may help set you apart. When I was at AirStrip, shortly after our founders presented behind Steve Jobs at the 2009 Apple Worldwide Developers Conference, we had the opportunity to meet leading investors as we searched for our first round of growth capital. Prestigious Silicon Valley venture capital firms had a placeholder for several years for a portfolio company to address mobility in healthcare, having passed on everything before AirStrip. As we built a relationship with the partners of a prominent Sand Hill Road firm, I later learned that it was not the content of our presentation (which we painstakingly developed for weeks) that attracted them to the company. Our allure was less about how we had built a broad platform for mobility specifically for healthcare or that we had proven the concept in obstetrics with a compelling value proposition. The investors were more interested in investing in the technical and clinical credibility, passion, and commitment of the founders to eliminate the geographical and informational boundaries that had historically hindered doctors, nurses, and patients from delivering and receiving the best possible care. People don’t buy what you do, they buy why you do it. As a call to action, focus on how to set yourself and your organization apart from others – at your core, not just in your presentation – but, good grief, for the sake of your audience, at a minimum step up your game in how you present! Understand your audience well enough to meet them at a common baseline so you do not waste time telling them information which they already know. Cut the number of slides in your deck in half (if you must use them at all) and ensure their purpose is to support your having a conversation with your audience, not to distract from it. Tone down wildly speculative claims about the market, potential ROI, forecasted revenues, etc. 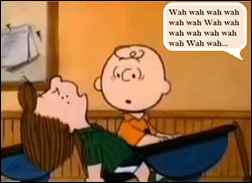 Most importantly, read your audience to see if they are hearing what you are trying to convey, or if instead you are coming across as Charlie Brown’s teacher: “Wah, wah wah, wah wah wah."